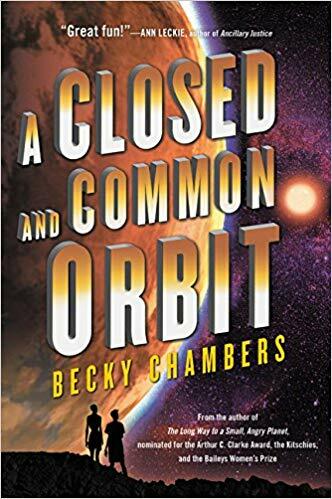 Chamber's second novel, A Closed and Common Orbit, in her Wayfarer series is so wonderful I cried several times. A Closed and Common Orbit picks up immediately after Chambers' first story, Long Way to a Small and Angry Planet concludes but is barely an extension of that tale, beyond further expanding on Chambers' wonderful universe. This novel follows a newly created, but ultimately undesired, shipboard AI that is forced to leave its vessel and take up a fugitive residence in a human appearing shell. Assisted by Pepper, a human who was genetically engineered as a slave, the AI has to find everything from a name to determining a purpose for itself. Completely out of the element for which it was designed, the AI struggles with friendships and body integrity disorder. The story alternates between that of the AI and Pepper, her human guardian. Briefly introduced as a very interesting Maz Kanata type in the first book, I wanted to learn more about Pepper. I was not disappointed, as her backstory is equally touching and tear-inducing. Genetically engineered to help sort and recycle junk, Pepper unwittingly escapes her keepers and spends years in a city-sized junkyard restoring a small spaceship. This wonderful search for meaning and identity in a harsh, harsh world is a must-read.